ACC Stands for Adrenocortical Cancer but is often known simply as adrenal cancer. ACC affects 1-2 people per million, per year, making it a very rare form of cancer. ACC occurs in the outer part of the adrenal gland. In adults, ACC most commonly occurs in the 4th or 5th decades of life. However, ACC can also affect children, where the disease may be less aggressive. In these situations, treatment differs from that of adults. Scientists do not yet know what causes ACC although there is on-going research being completed around the world – our support network can help to keep you in the loop and up-to-date on the research findings. 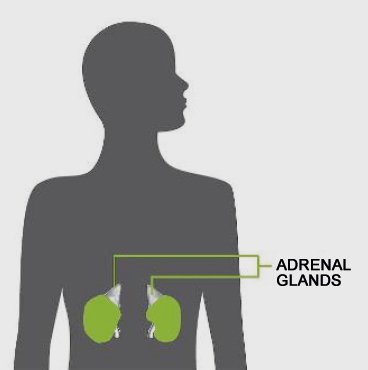 The body has two walnut-sized adrenal glands, one above each of the kidneys. Even though the glands are small they are important, as they produce several hormones (the body’s chemical messengers) that are important for life. The inner area of the gland produces a number of hormones, which help the body to maintain blood pressure and deal with sudden stress or threats. The outer area of the gland produces hormones called steroids. These steroids help the body to maintain blood pressure as well as salt and sugar levels. A steroid called cortisol is also an important messenger in our bodies’ response to stress and illness. For ACC, the treatment that offers the best chance of a cure is timely surgery by a specialist surgeon. Surgery should always be followed up with further treatment managed by a team of multi-specialist doctors (a multi disciplinary team) that meets regularly to discuss ACCs. It’s important that you are referred to a multidisciplinary team, who are experienced in caring for patients with ACCand other adrenal tumors. For ACC, the treatment that offers the best chance of a cure is timely surgery by a specialist surgeon with follow-up and any further treatment managed by a team of doctors of different specialties (a ‘multidisciplinary team’) that meets regularly to discuss ACCs. You should make sure that you have been referred to a multidisciplinary team which is experienced in caring for patients with ACC and other adrenal tumours. Does ACC run in families? Most ACCs do not run in families; however, a number of rare conditions can increase the risk of ACC. Therefore, if an individual with ACC has other members of the family diagnosed with cancer aged 50 or less, they should ask for referral to their Regional Genetics Service. ACC Support UK, with the help of its expert advisory team, have prepared more detailed patient information booklets on ACC which are available to download for free by clicking on the link beside the picture to the right. Contact the general enquiries number to order your free hard copy.